Rockefeller Center in New York - Top of the Rock Observatory. 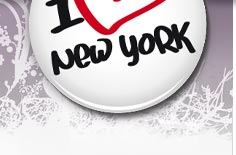 Address: 600 Fifth Ave., New York, NY 10020 at 49th St.
RFC is a place for approx. 19 commercial buildnings between 48th and 51st Street. 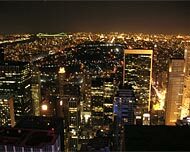 The place is situated in "Midtown Manhattan" and are located between fifth Avenue and sixth Avenue. Todays Rockefeller Center is a combination of two big building complex, the old Art Deco-buildning from 1930´s and one set of four international buildnings from 1960´s-70´s. Time-Life buildning and News Corporation/Fox News Channel today belongs to the "new" Rockefeller. Rockefeller Center has got it´s name from John D Rockefeller Jr who rented the area from Columbia University 1928. After that he developed the area between 1929 - 1940. In his plans from the beginning was to build a big Operahouse, but instead it became Radio City Music Hall (the worlds biggest indoor theatre). Today the area is also known for its Art-Deco buildning (GE Buildning) with all the different nation flags who are placed in a long row outside the buildning. Below stands the well-known statue, golden "Prometheus" by Paul Manship. He is overlooking the rink, who in summertime is used for roller skates and in the wintertime skating. At Christmas time (Dec-Jan) a gigant Christmas tree is placed here with over 30.000 lamps. The area is also known to be a big place were a lot of people are passing through during the day and here are also on of the biggest places for shopping. The main point in Rockefeller Center is the buildning Rockefeller Center, 71 floors high. The skyscraper is headquarters for NBC. At the 65 floor you will find a restaurant. 1989 the Rockefeller Centre Complex was bought by Mitsubishi, ten years later, Tishman Speyer Properties L.P bought the place from Mitsubishi. The observatory is open every day. Entrance: 50th street between 5th and 6th Aves. Go up to the 70th floor at 30 Rockefeller Center and take a look at the view. There you will find Top of the Rock - a newly opened observation deck. The view is unique and fantastic. You will get a clear sight at all directions with the 360 degree view. The observation deck is opened 365 days a year and until midnight - with other words - always. Why dont´t visit for a nice sunset over New York . 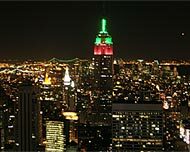 View from Top of The Rock - New York Dec. 2006: Empire State Building, Observationsdeck, Central Park View. TV and Movie Locations Tour with Official NBC Studios Tour! 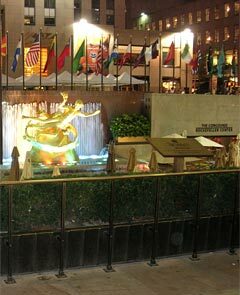 In the GE Building at Rockefeller Center NBC has its recording studios for wellknown television shows. You find recording studios for programs such as SNL (Saturday Night Live), Late Night, Football Night in America, 30 ROCK, MSNBC Live and the Today Show and others. Tours of the NBC television studios have been taken place since the 30's and is a major tourist attraction in New York. Why not make a visit? 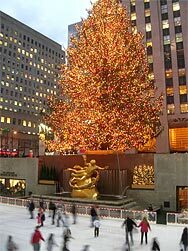 Before every Christmas the Rockefeller Centre management is looking for the perfect spruce. Every year they get a great deal of letters and pictures sent to them with big spruces, from people who want them to choose their spruce. The Management is travelling every year in person around the US to view the spruce which will represent Christmas. It is not easy to find - there are only one in a million who has the correct size. The spruce that they really want to have is a Norwegian spruce because these will grow to become big and nice. They can be up to 110 years old. These spruces are planted in the US and will grow best by themselves (not in a forest). Mini-size for the spruce is 65 foot-tall and a least 32 foot-wide. The ultimate high is 98 foot-tall and it shall be so dense that it will not let any light through. When the spruce is decided it will be transported the whole way to Rockefeller Centre in the middle of the night so it will not disturb the traffic, by the support of the Police. After the spruce have benn decorated with all the lights there is a spectacular opening ceremony for all and Christmas comes to New York. Some years: The highest spruce ever is the spruce who was standing here 1948 and was an Norwegian spruce from Killingworth approx 108 foot-tall. 1966 they couldn´t find any spruce in the US, but one was found in Ottawa Canada. The first time the spruce was seen in the TV with the lights on was in year 1951. Since year 1971 the spruce is reused after Christmas, among other things it is donated to the scouts who is using it as cover material to their camps. Year 1939 they started with the traditional Christmas songs at the spruce. Year 1941 the spruce was never on with the lights, due to the attack against Pearl Harbour (II World War) and possible lights-out in the city. Picture: The Christmas Tree at Rockefeller Center, New York. December 2006. The Rink at Rockefeller Center! The ice rink at Rockefeller Center opened for the first time on Christmas day, 1936. The rink is visited by about a quarter of a million people every year. Skating rink is about 37 meters long and 18 meters wide, and you can go up to 150 people at the same time. You pay for the rental of skates and go. See website below for pricing.